Eulogy - Wisdom is the retention of innocence through adversity. I can't figure it out....can I still get the lottery ticket. lol, watch yourself he promised me jellybeans ages ago and I still haven't gotten them. Ha ha Sara! You got part of it! But it goes even deeper! Are you up to the challenge??? Awe! Well, let's see... There's another word in there. There's a number. And there is a reference to someone in history - the cricket. "Isn't it sad" is also correct. 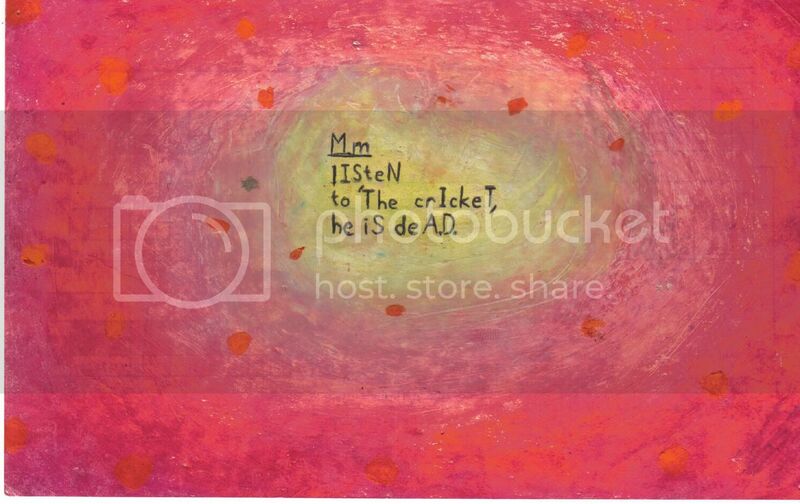 Who does the cricket represent? ok I saw the "Isn't it sad?" right away and I noticed the A.D. (anno domini) right away also. I read what you wrote in the other comments and I got the 1000. But who are you talking about? It's it sad that in 1000 A.D. a cricket died? lol, cricket was invented? I automatically think of th esport cricket when I see that word. So I'm wracking my brain trying to figure out what you're talking about. ok - you're almost right on - except the year isn't 1000. There's another word in there - maybe if you get that, it will clear away the year confusion. I gave a hint to its_fate on that other word.